1936 - Here is a VERY RARE Vintage looby card from the H.G. 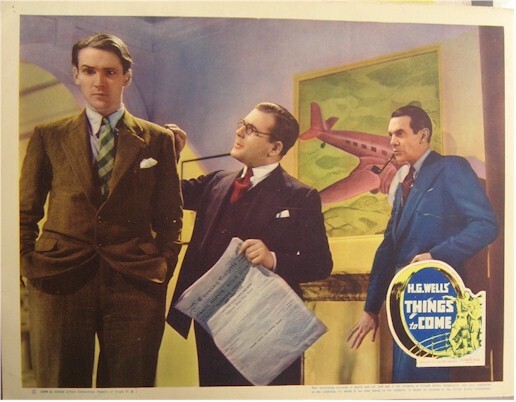 Wells Sci-Fi Classic "Things To Come". Excellent condition. This is the first we have ever seen on this title. The only one sheet recorded as being sold in 1999 went for $8700. There are no record of a lobby card ever appearing on the market as of my 2001 Poster Almanac. SCARE! Great graphics with vintage, 1930's aircraft in the background.